Geovariances has recently implemented for a series of clients an innovative methodology to constrain grade estimates. The methodology offers an alternative to the use of existing wireframes that may be considered as affected by too great a level of uncertainty in order to be used for the flagging of the estimation block model. Resource estimation procedures usually rely on the preliminary interpretation of mineralized volumes followed by grade estimation within the interpreted geological domains. The validity of the geological interpretation is highly dependent on the density of information supporting the interpretation. Areas of sparse drilling have an increased risk of over/under estimation of the mineralized volumes. The traditional geostatistical approach in that situation is to conduct a probabilistic estimation of the mineralized volumes by Indicator Kriging (IK) of the mineralization flags interpreted at drill holes level, in keeping with the idea that away from information there is a fair degree of uncertainty placed on the occurrences and actual location of the mineralized bodies. IK offers the ability to estimate proportions of material within a panel that are deemed to be mineralized. The panel size estimated, which is constrained by the density of information is usually too broad in comparison to the geometrical resolution required for mine design. And whilst this resolution is imposed by the actual data density one may still be interested in trying to localize that proportion in space using a resolution that is more compatible with the envisaged level of mining selectivity. 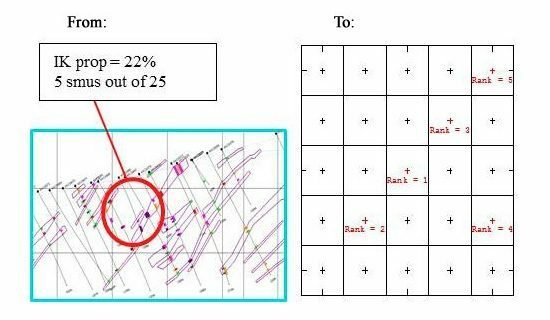 To that effect the existing Localized Uniform Conditioning module of Isatis has been used in a roundabout way aimed at retrieving the rank of the smus for which the cumulated ore proportions from smu’s match the desired ore proportion of the panel. 4. That way the smus are flagged as being entirely ore or waste and are amenable to receive the results of parent panels estimates (for example via the localisation of UC results at recoverable resource estimation stage).